‘Infrastructure for philanthropy is rather more like a skeleton than scaffolding. You need it all the time and, unlike scaffolding, you can’t dispense with it,’ commented European Foundation Centre CEO Gerry Salole at a meeting of ‘infrastructure funders’ earlier this year. Just as the human body would collapse without a skeleton, so philanthropy can’t function without its support and development infrastructure. Whether that’s high-quality data and research, bespoke advice and consulting, training, advocacy or representation, there is an essential and vibrant but under-appreciated ecosystem of philanthropy support worldwide. The puzzle for many of our sector’s most thoughtful practitioners is how best to provide the sustenance which philanthropy needs to do its job better, while making it financially sustainable. The fragility of infrastructure is particularly unfortunate (and hard to stomach) given the relative wealth of major philanthropic institutions and foundations. 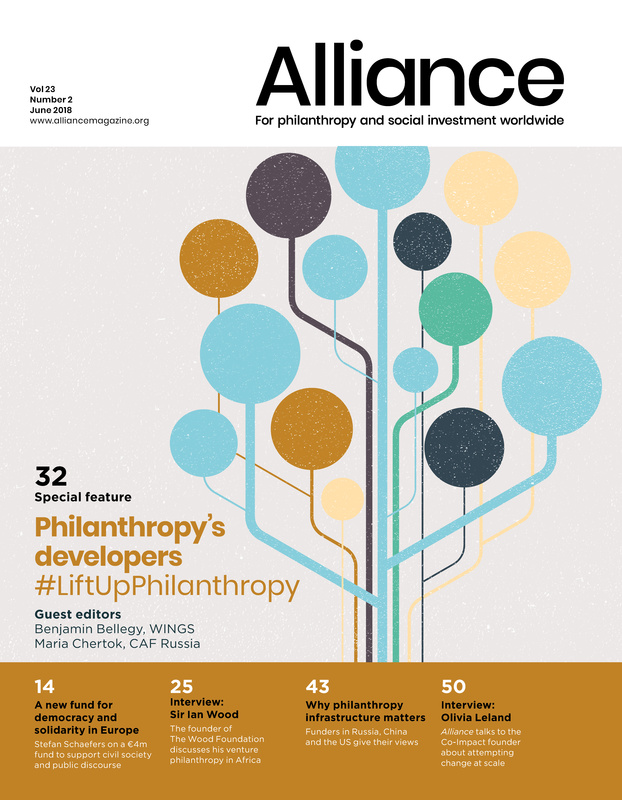 The special feature in this issue, superbly guest edited by Benjamin Bellegy and Maria Chertok, places philanthropy’s infrastructure under the microscope and highlights its potential. It offers a new and change-oriented vision for the future development of the field, building on detailed research and engagement over the last few years, some of which is highlighted in the issue. I hope you enjoy reading about the rich diversity of people and organizations at the centre of philanthropy’s central nervous system, the views of leading funders about why infrastructure matters, and the core issues ranging from the impact of tech to the lack of data and the need for more collaboration and resources. Elsewhere in this issue, you can read about a major new fund to affirm the values of democracy and solidarity in Europe. And for something completely different, meet Scottish philanthropist, Sir Ian Wood, and read about his foundation’s unique blend of ‘tea philanthropy’ in Africa and ‘car parks philanthropy’ back home. The diverse issues, developments and trends in contemporary philanthropy deserve greater debate and attention and we, at Alliance, are doing our best to provide it. Thank you for your continuing support, feedback and engagement. Enjoy the issue and keep reading!